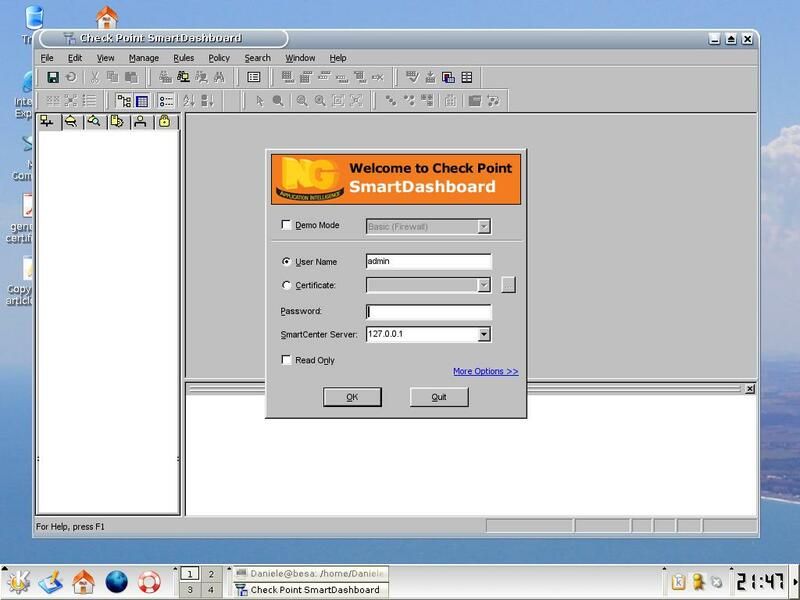 We waited for a long time the Checkpoint release of SmartConsole for Linux. Unfortunatly Checkpoint never released it, but with the last WINE release (http://www.winehq.org/) we can do it ourself! WINE is a free implementation of the Windows API for Linux, able to run many application created for Microsoft’s OS. In the earlier version I’ve tried to run SmartConsole, but it failed with errors… but now with Wine release 20050310 something is changed! In this paper I’ll explain how to setup either Wine and SmartConsole, but my assumption is that you are familiar with a Linux system and with installation programs. You have many installation options for Wine.Take a look at http://www.winehq.org/site/download for a list of distro with its packages. The run an â€œapt-get updateâ€ to download the new info. Please note that wine-utils is very important: for example it contains the reboot script used in program setup like Internet Explorer 6.0.
this create a fake windows drive in â€œËœ/.wine/câ€, check the right path in your system. This process give me an error but I’ve ignored it without problems. It’s important to setup DCOM because they contains some files needed by SmartConsole, like OLE32.DLL. Then we need to copy a few .dll’s file to get it work! and check if it runs. If you got a list of error, just check the first few lines looking the missed DLL. otherwise try re-installing DCOM98 from â€œwt2â€ (Winetools). Daniele Besana is Checkpoint certified CCSE 4.1, CCSE NG and CCSA NGX.